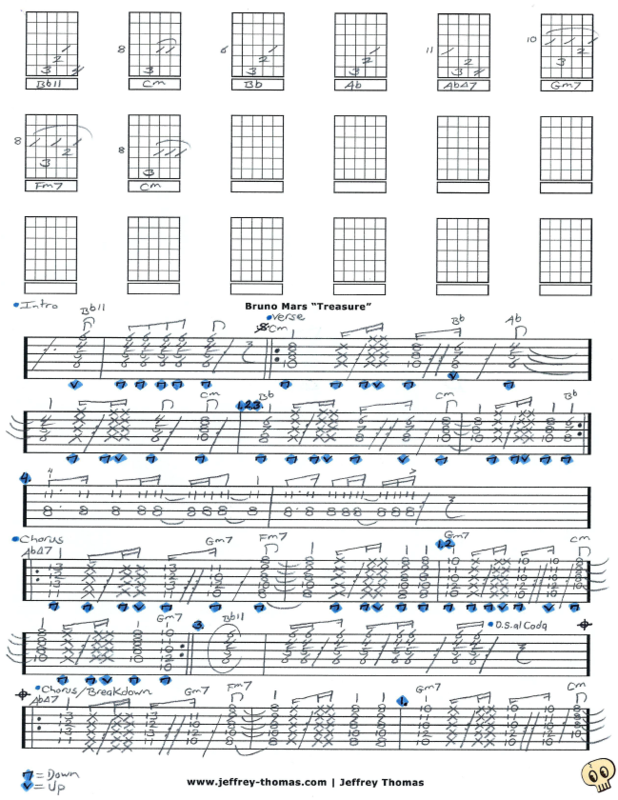 Bruno Mars Treasure Free Guitar Tab by Jeffrey Thomas. I have all the right chords and licks for this retro disco-pop tune by Bruno. Learn the complete song structure, intro, verses, chorus and breakdown with picking details so you get the funky technique right. This is such a fun song to play! All my guitar students who like funk are learning Treasure. Want the full guitar tab for free? Just send in your email address using the form provided and I’ll send it to you. Looking for funk guitar lessons? Fill out the Schedule A Free Lesson form to set up a free Skype guitar lesson today. “Treasure” is the 7th Top 10 hit for Bruno Mars! Check out more online guitar lessons on my tab, video and blog pages.